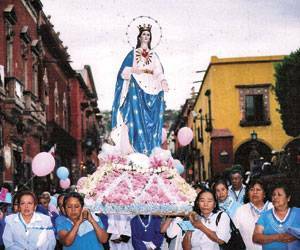 On August 17th the Virgin of the Three Hail Marys is a popular San Miguel festival continuing to celebrate Mary’s ascent into Heaven. It is said that in 1960 Father Benjamin Grimaldi Balderas built the chapel to the right of the main altar in the Templo de Salud (Temple of Health) to venerate Our Lady of Three Hail Marys (before that it was a barn). Three Hail Marys is a traditional Roman Catholic devotional practice of reciting three Hail Marys after waking in the morning and before going to bed, following the examination of conscience at night. This prayer was recommended by St Anthony of Padua (patron of Dia de Locos) and began in the 12th century when Saints Mechtilde and Gertrude received visions of Mary encouraging the three payers to honor the trinity of God the Father, Son and Holy Spirit to aid at the time of your death. 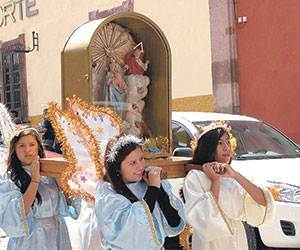 To celebrate the Virgin, devotees hold a procession through the main streets of town accompanied by dancers, children dressed as angels, bands and over 200 worshipers. During the day of the celebration, there are musical performances and evening fireworks.